Skip the tortilla for this wholesome take on steak fajitas. Flank steak takes on the flavors of a bright, pineapple-spice marinade. It’s grilled (or seared) and served with sautéed fajitas veggies, plus a garlic, lime, and cilantro rice. Add corn, salsa, guacamole, and Cotija cheese—plus a squeeze of lime—and you’re ready for a healthy fiesta. 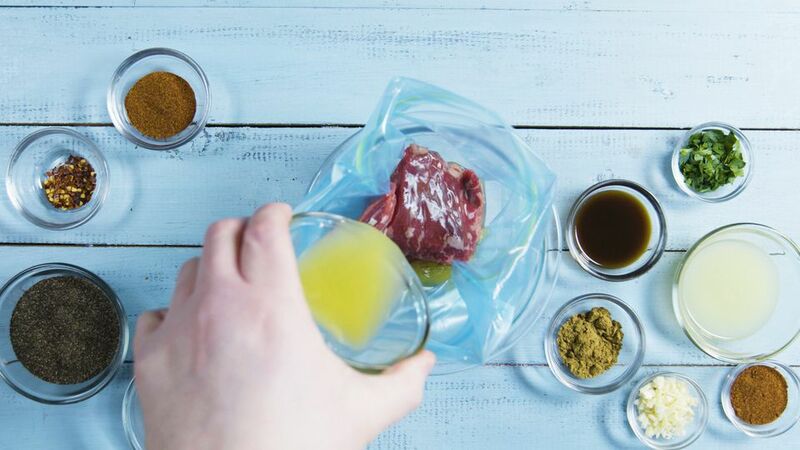 Make the marinade: combine all the ingredients and marinate the meat, covered in the refrigerator for at least 2 hours and up to overnight. Remove from the refrigerator about 30 minutes before cooking. Warm a cast iron skillet over high heat. Add the steak to the pan and cook on each side for about 3-5 minutes, longer if you’d like it more done. Feel for desired firmness. Remove the steak from the pan and let it rest under foil for 10 minutes. Thinly slice the steak against the grain. Make the fajita vegetables: Add oil to the same pan over medium high heat. Add the onions, poblano and bell peppers. Cook for 3-5 minutes or until your desired softness, tossing frequently. Add a pinch of salt and pepper to taste. Set aside. Make the rice: Heat the butter in a pan or pot over medium heat. Add the rice and toast for 2-3 minutes, being careful not to burn it. Add the garlic and cook just until the garlic is fragrant, about 30 seconds. Add the chicken broth, salt, and lime juice. Bring it to a boil. Cover, reduce heat to low and allow the rice to cook through, absorbing all the liquid. If you’d like to add some chopped cilantro, let is stand for 5-10 minutes and then stir in.